22nd June, 2015: I haven’t been able to blog for the past week as we had a very hectic schedule ranging from lectures to observing to tours around the observatory and more. On Saturday we submitted our projected proposals for CUREA after a 3 hour discussion session with the instructors and participants. Projects include solar rotation, Zeeman splitting in sunspots, asteroid rotation curve, light curves of RR Lyrae stars etc. I chose to do an instrumental characteristics project which will study the instrument used for photometry and determine its limits and optimum performance values. I chose this project as I feel that it is extremely important to know your instrument before you use it. Also, since I am an engineering student I will get to learn a lot about the instrumentation behind CCDs and what instruments exactly are needed by astronomers. Also, my data will be valuable to others doing photometry using the same CCD. We started the day at 9 am today after last night’s observations of image parfocality. 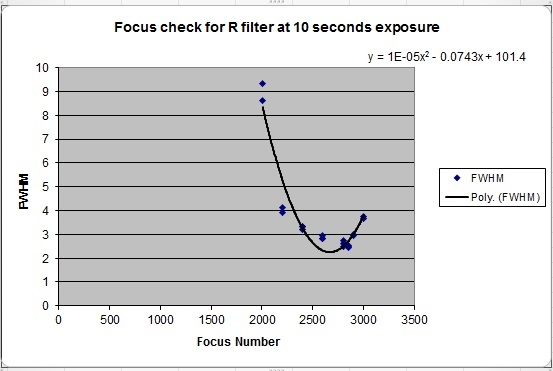 I plotted the observations for change in filter and its effect on focus or Full Width Half Maximum (FWHM) and found out that it is quite parabolic in nature. At 12:00 noon I went to the galley for Lunch and met Prof. Bob Buccheim who is guiding me with the project along with Dr. Turner and Prof. Mike Simmons. Bob and I spoke for an hour over lunch on the possible procedures to follow for measuring the linearity of the CCD i.e. 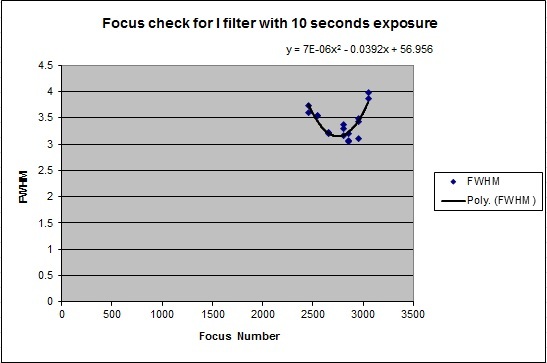 with change in exposure the number of photons accumulated in the CCD increase linearly. This is valid till a certain range where it saturates. Our goal is to find out this range so that observers know about it during their observations. Bob did show how fascinating it was in the era of film cameras where people found out the linearity by knowing the density of the material of the film. At 15:00, Dr. Turner, Mihyun, Jacqueline, David and I left the mountain to visit my roommate Garret who had been hospitalised last night for a pancreatic flare up at a hospital in Los Angeles. We greeted him with a card signed by all of us and flowers to brighten up his mood. He looked quite optimistic and was desperate to return to complete his project. Doctors will probably discharge him on Wednesday. On the way back we had coffee in a Californian coffee shop. The ride back up the mountain was with songs from Coldplay, Led Zeppelin, Adele, American Hip-Hop, Michael Jackson and even Whistle Podu of Chennai Super Kings (which was on demand by the Americans and liked)! After dinner at 19:00 I went to the library to work out the dependence of dark current against temperature and I was baffled to see that it follows the Arrhenius Law from Chemical Kinetics I had learned in 12th Grade. I outlined the final procedures for my experiment till about 20:00. At 20:30, Bob and I went to the 16 inch dome and setup the place for the night. Clouds have been prevalent all day and so we decided to go for measuring linearity with a light box setup. We took flat frames for about 5 second exposures to see how uniform the light box was and it looked pretty awesome. However the edges were having a peculiar shape where light was far less than the other portions of the CCD. The temperature of the CCD was set at -12 degree Celsius and Bob speculated we were dealing with frost on the CCD. And indeed we were! After increasing the temperature to about 5 degree Celsius the frost disappeared. Since the CCD wasn’t cleaned for about a year, he expected the desiccant to be malfunctioned and we replaced it with a new one. For the next 2 hours I worked on taking flat frames at different exposures and calculating the ADUs (Analog to Digital counts) of pixels. The pixels saturated at 120 seconds of exposure and then I took successive readings with decrements of 20 seconds. The linearity looked quite consistent from 30000 ADUs and we’re hoping to get a good plot during data reduction. At 23:30 we removed the light box and opened the dome for sky observations. My next target was finding out the uniformity i.e. how sensitive is every pixel to light – is it equal (ideal) or deviates (if yes, how much?)? For this we chose a star of about 6th magnitude close to the Zenith so that the Air mass would be the lowest. I took 5 second exposures of it at different positions on the pixel and that’s where the skill of operating the telescope came VERY handy. And more than anything else the knowledge of Right Ascensions and Declinations I had learned at Akashmitra came VERY VERY handy. Just by knowing the RA of a star I knew where to point the telescope and how to move the dome. At about 00:45 I was done with my observation set as Jacqeline had to work on her variable star. I reported to the director (who was awake working on an Arduino project) about the observations and what needs to be done during the day time. Its about 2 in the morning and I will take a nap for a few hours and get down for analysis in the morning.